Around our house there is a lot of frizz to tame. Not everyone needs to put a cream or serum in their hair but for me and Mikayla it is an absolute necessity. In researching homemade household products, I found that a hair serum could be made from products I already had on hand so I thought I’d give it a try. Keep in mind that my requirements for homemade products are that they 1) save money, 2) are easy to make and 3) work well. Coconut Oil is the main ingredient. It is a unique oil in that it liquefies at about 76 degrees and when it cools it returns to a creamy solid. It is a food grade product that has many nutritional benefits when used in cooking. It is also good for your hair. Again, not everyone can get away with putting oil in their hair. We have thick, coarse, curly (very, in Mikayla’s case) hair that soaks up the extra oil just fine. I imagine that it would weigh down softer, finer hair or make it look too oily. The coconut oil is fine on its own but I also had some pure Vitamin E oil on hand and mixed in a few drops. Vitamin E is also really good for your hair and skin. I just poured the liquid coconut oil in a travel size bottle and mixed in a few drops of vitamin E. It solidifies between uses but I just sit it in a cup of hot water to melt. It doesn’t hurt the oil to let it solidify and re-melt and since it melts at 76 degrees it only takes a few seconds. You could also store it in a jar and soften a little cream in your hands for each use. A little goes a LONG way. Just a few drops is all you need. Seriously, just drops. I really like this oil for us. It does a great job of softening my coarse hair and calming Mikayla’s curls. I don’t know that I can break down the price because such small amounts are used. 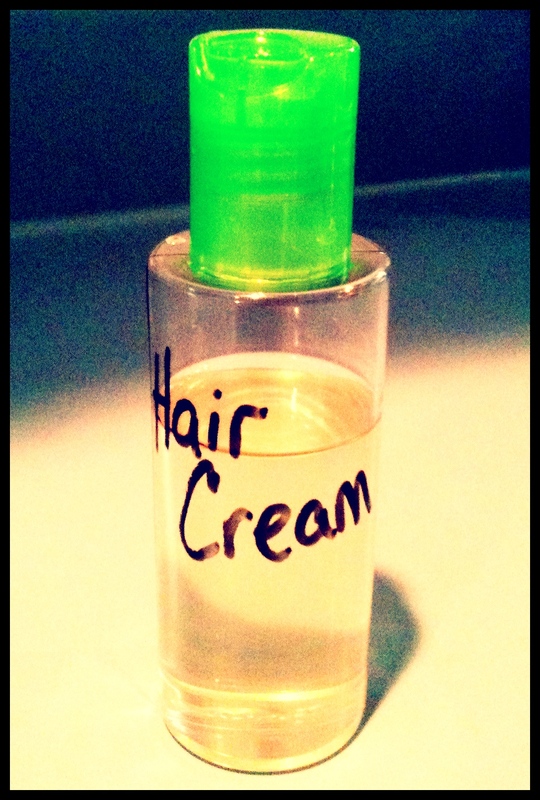 It’s cheaper, and longer-lasting, than the $3-4 bottles of hair cream you can buy at the store. So I consider this DIY product a success! Would you consider putting oil in your hair, or am I the only one?